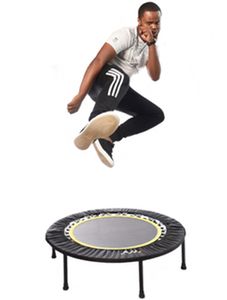 Rebounding has longevity because it is easy to commit to as it is highly enjoyable, time efficient – and leaves you feeling de-stressed, invigorated and energised! People who rebound find they are able to work longer, sleep better, and feel less tense and nervous. 1 Exercises the cells (cellercizing) – strengthening and cleansing every cell in your body with every bounce (including your muscles, eyes, ears, heart, major organs, skin etc). 2 Supercharges energy levels – and keeps energy up through the day. 3 Boosts lymphatic drainage, detoxifying the whole body and stimulating immune function. 4 68% more effective than running, without the impact stress on the ankle and knee. 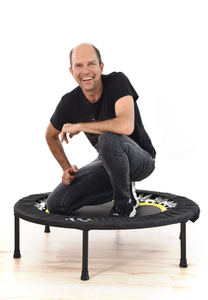 20 Minutes of vigorous bouncing has the same value as 60 minutes of running. 5 Increases bone and muscle density via the triple G-Force (gravity, acceleration and deceleration) of each bounce. 7 Minimizes the occurrence and duration of common ailments such as colds, allergies, sinusitis and constipation. 8Decreases the incidence of illness and disease – provides a good form of long-term health insurance against chronic and acute conditions. 9Reduces sugar and carbohydrate cravings by circulating more oxygen to the tissue and establishing a better equilibrium between oxygen required by the tissues and oxygen made available. (When oxygen levels drop, more glucose is needed to produce energy). 10 Oxygenates all the tissues – and where there is oxygen, there cannot be pain or disease. 11 Improves coordination enhancing sport performance. 12 Enhances proprioception the ability to sense the position, location and movement of the body and its parts. 13 Helps manage body composition and improves resting metabolic rate so that more calories are burned for hours after exercise. 14 Boosts endurance 1.	at a cellular level, by increasing mitochondrial count within the muscle cells (responsible for energy production). 15 Tones the glandular system to increase the output of the thyroid gland, the pituitary gland and the adrenals. 16 Reduces the time it takes for heart rate to return to normal after intense activity. 17 Lowers low-density lipoprotein (bad cholesterol) in the blood and increases high-density lipoprotein (good cholesterol) reducing the incidence of coronary artery disease. 18 Helps fluid move easily within the body, thus helping muscle performance and lightening the load required of the heart. 19 Decreases the volume of blood pooling in the veins of the cardiovascular system preventing chronic oedema. 20 Lowers resting heart rate each beat becomes more powerful and sends out a greater surge of blood around the body to nourish its 60 trillion cells. 21 Boosts red blood cell production in the red bone marrow. Red blood cells carry oxygen and nutrients to the tissue and help to remove carbon dioxide. 22 Promotes tissue growth especially long bones, due to the stimulating effect of the pituitary gland, which produces growth hormone. 23 Stabilizes the nervous system – resulting in and increased resistance to environmental, physical, emotional and mental stress. 24 Reduces the height to which the arterial pressures rise during exertion. 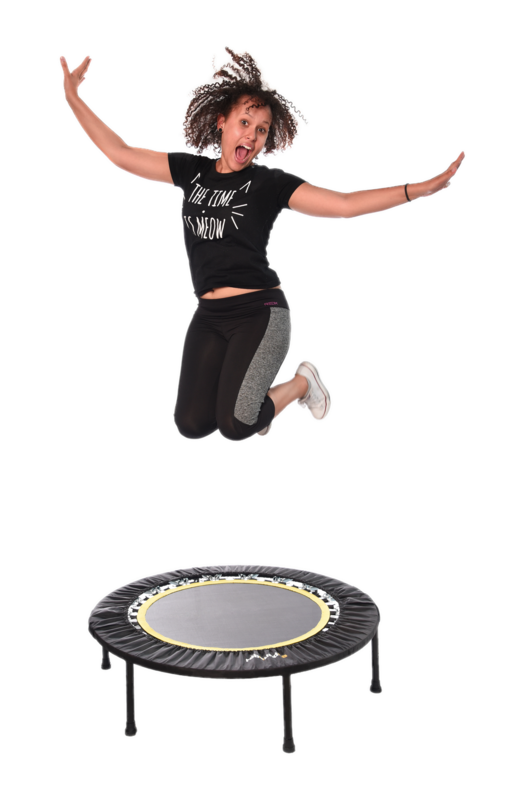 25 And MOST importantly it is suitable for all ages and all levels of health and fitness … your body loves to bounce … Rebounding is FUN! How does this miracle exercise work? Imagine standing on a solid floor and bouncing in the same place for 20 minutes. This could be a phenomenal fitness workout – but you would be exhausted (even after 5 minutes because this is more strenuous than running) and the jarring impact would damage your joints and probably leave you with a very sore back and a headache. 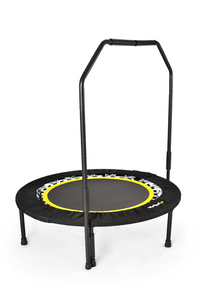 Doing this on a rebounder however, is a COMPLETELY different story.